My day is made when I happen upon something as rare as this 1980 Volvo 262C Bertone coupe (only 6,662 sold world-wide!). It’s basically a 262GL sedan with a new roof stamping, designed and installed by the Italian custom coachbuilder Bertone. 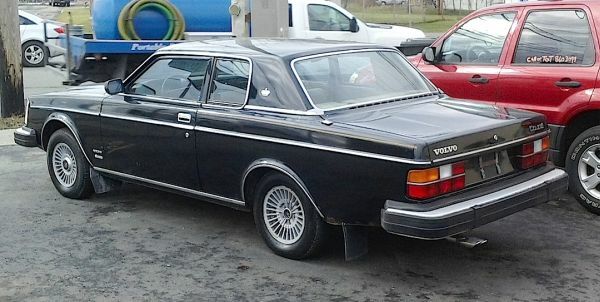 The roof was not only more squared-off and formal-looking than Volvo’s regular 262GL two-door sedan, it was also three inches lower, necessitating a design change in the seats to accommodate the passengers’, um, heads. Early examples came standard with vinyl tops, which were eventually made optional before being totally dropped for the final 1981 model year. Saw this one a little while back, for sale, in North Tonawanda. Jim Corbran, RRofWNY …and check out our Facebook page: Non-American Classic Cars The post RealRides Of WNY appeared first on Buffalo Cars.